Upper body workouts are critical for adding strength and building mass. You need to learn lifts for building larger and stronger deltoids and to ensure less risk of injury during workouts. You need to do specific workouts for your deltoids which will help in safeguarding them from all injuries. Strong deltoids are essential for body-builders and sportsmen. Start the workout by holding a dumbbell in your hand. You will sit just at the edge of the bench. Your lower back shall be flat as you lean a bit forward. You will gather strength and straighten your whole body. Shrug the weights you have so that your arms are able to rise. The momentum shall flip the wrists so that you are able to catch the weight at just the shoulder level. The main target area for this workout are the rear deltoids. This workout is about a leverage which helps in handling more weight than other workouts. You will start by putting a rope attachment on the pulldown machine. The weight you select should be able to counterbalance your own weight. Stand confidently in front of this pull. Hold the rope overhead. Your palms shall face one another. You will then slowly lift up your elbows to the shoulder level and also the sides. Keep one foot on kneepad. This shall help you in anchoring better. Now, slowly lean back. Your body will be forming a 45 degree angle to the floor. Your elbows shall be in an elevated position. You can now pull back the rope. Bring it close to your face till your hands are near the ears. You will squeeze and then reverse. Your weight shall stick down as you do the repetitions. Start by setting the bar in a cage or a rack. You can grasp it outside the shoulder width. 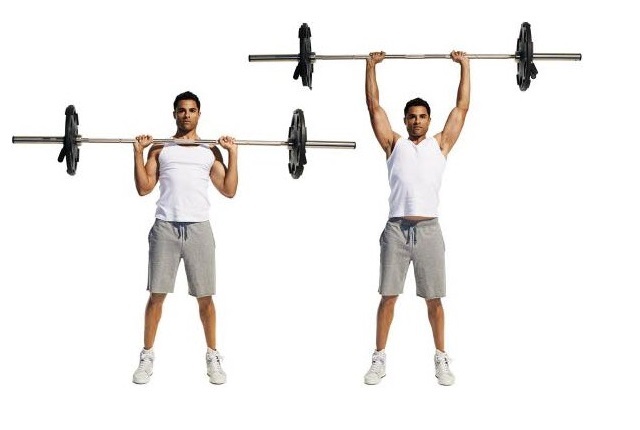 You can take the bar from the rack and then hold it to your shoulder level. Keep your forearms perpendicular to the ground. You can now squeeze this bar and slowly brace the abs. You can press this bar overhead. You will push your head a bit forward. Keep shrugging the traps whenever the bar passes the face. This workout is just perfect for building strong deltoids. Start by sitting on a bench. 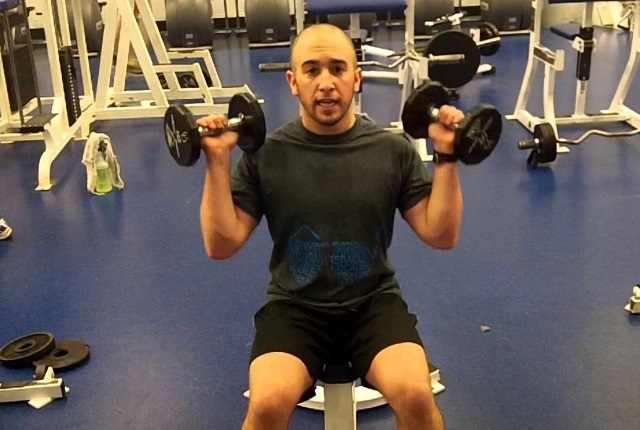 You will hold a dumbbell in your hand just above the shoulder. Your palms shall be facing forward. Your head shall be straight. Your spine will be aligned. Keep your eyes well focused forward as your shoulders are shifted back. You will be pressing the dumbbells in this move. The dumbbell is in an arc position towards one another. Do not let them touch the topic. You will squeeze and then move to reverse the motion so that you get back to the starting position. Repeat the move. This seated dumbbell is quite effective and reduces all possibility of balance imbalance. You will place a bench in a low incline position. Lie chest down. You shall have a dumbbell in your hand and your palms shall face one another. Now, slowly retract the shoulder blades and move to raise the dumbbells out so that you have your arms quite parallel to the floor. You need to repeat ten times to start with. 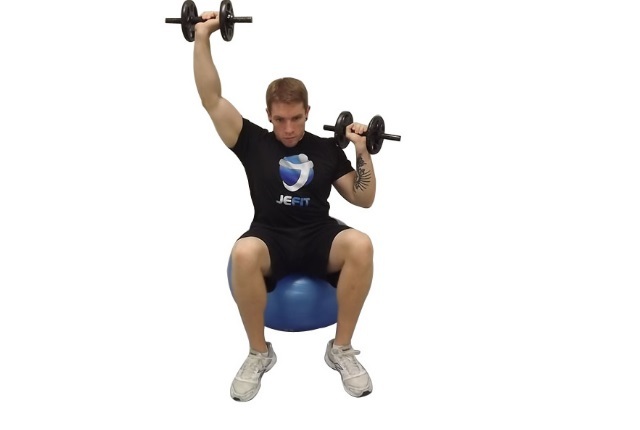 This simple workout will work on your shoulder muscles and help in building stronger delts.